MATS (Mesospheric Airglow/Aerosol Tomography and Spectroscopy) is a Swedish satellite mission scheduled for launch in 2019. MATS science focuses on mesospheric wave activity and noctilucent clouds. The platform consortium comprises OHB Sweden and ÅAC Microtec and the the instrument consortium comprises, the Department of Meteorology (MISU) at Stockholm University, the Department of Earth and Space Sciences at Chalmers, the Space and Plasma Physics Group at KTH and Omnisys Instruments. Primary measurement targets are O2 Atmospheric band dayglow and nightglow in the near infrared (759-767 nm) and sunlight scattered from noctilucent clouds in the ultraviolet (270-300 nm). While tomography provides horizontally and vertically resolved data, spectroscopy allows analysis in terms of mesospheric composition, temperature and cloud properties. 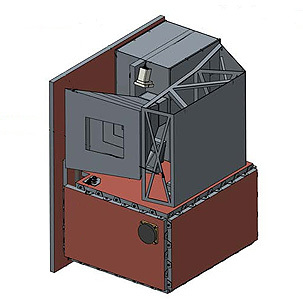 MATS features two science instruments: the limb imager and the nadir imager. MATS carries a total of seven imager channels that view the Earth's atmosphere in selected wavelength intervals. Six of these imager channels view the Earth's atmosphere in the limb direction looking tangentially through the atmosphere, while one imager channels views in the nadir direction. The 50 kg MATS is the first satellite based on the InnoSat platform will also serve as a pilot mission in an intended program of small, low-cost research satellites funded by SNSB (Swedish National Space Board). MATS will be launched in 2019 as an auxiliary payload into a 600 km dawn/dusk circular sun-synchronous orbit.